Probably one of the hardest things to coordinate was getting the piano out of my mom’s house- which she had finally sold- and up to my apartment. 150 miles, from a large Victorian in Pacific Grove, to a small 1-bedroom in San Francisco. First, I read an email in line at Trader Joe’s from my Mom that she needs x,y,z moved out of her house, including, the piano. Could I? The crazy idea of having a huge antique piano in my tiny apartment. Almost everyone I told thought it was crazy, for my under-700 square foot apartment. Granted, the reality is that as I write this, I’m sandwiched between a coffee table, an end table, and a media shelf destined for GoodWill. 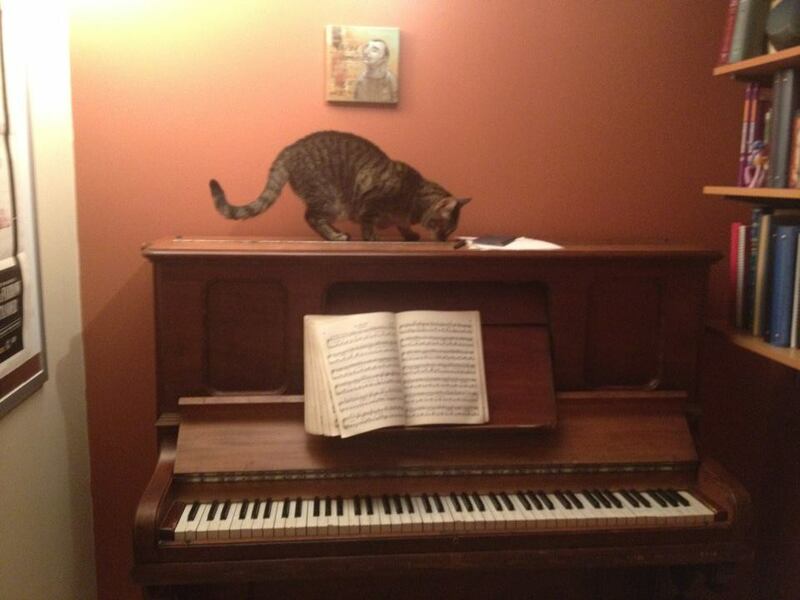 All of my older siblings have passed up the piano. They have pianos, sure, but they are smaller and in tune. This piano is old, it’s quirky, it’s got a deep tone but it’s inherently flawed- a shifted part means it will never be 100%. I do really like the sound it makes, but I know that in the hard light of day, it needs some serious tuning love. We always had music lessons growing up- piano at home, and an instrument for band or orchestra in school. A perk of being the youngest is that I got good piano lessons earlier than the other kids, and I got lots of material to learn on. Lessons were wasted on me when I was a young kid. For some reason at 16, I ended up paying for piano lessons, which seems weird to me now. I don’t know why I didn’t put that money towards cello. My cello playing was pretty good, I was proud of being first cello in our regional orchestra. In college, I lived next to the big house that was the music hall. So I could play on any of the 10 grand pianos any time of night. And, I could hear from older students criticizing my playing, which was new to me, coming from the loving fold of adoring family. Moving out onto my own, I thought I’d got to practice studios but never did. I joined a band, tried other instruments, but as a renter, never really considered owning a piano. I’m not a great piano player- my teacher used to comment on how I was into “certain music” (romantic) and to her credit, she got me into some more weird modern pieces that I like now. My hands are pretty small, with barely any span. I have a very subjective (ha) relationship to rhythm. I can read really well, but never learned to improvise well or play jazz. I get nervous when I have to accompany people. My favorite times are playing in the afternoon, when there’s a lively conversation in the other room. I like to get in that zone of half-hearing, half-paying attention, when I’m going along with the notes, figuring out the phrasings, the melodies, pleasantly surprised by some new thing I’ve learned, but not working too hard. Back to the practical: moving the piano. I have learned there are specialists, and they are incredible. In mid-day traffic near Lombard Street, three guys stop the truck, raise the back, move the piano out, ride it down the ramp, push it across the busy traffic with the light, push it into my building, up the elevator, down the hall, do a tight turn, and plant the instrument right in the cubbyhole. In about 15 minutes. 750 pounds. The piano is a Kranich & Bach, made in Harlem, NY. Five years after being a foreman at Steinway & Sons, due to labor strikes & disputes, Kranich left and formed a cooperative with 11 other ex-Steinwayans, the New York Piano Forte, Co. In 1874, he struck out with a colleague Bach, the cabinet-maker, to form Kranich & Bach. It was during this time, pre-1900, that my model was built (I can discern from the serial number). Known for its rosewood and mahogany, and other fine woods, they started making these adorable baby grands. Not quite respectable now- considered by many Honda of old pianos- the piano company was bought over and over again, and yes, at one time manufactured in China. Some consider pianos from this earlier period collectible. I don’t know anything about the original owner – my folks bought it used so my mom could relax (her words). At that time she was a young bride with a new son. Then, they moved it to DC, various houses in the LA area, to Monterey, to San Jose, and then back to PG. The only piano move I witnessed, was when my dad tried, by himself (and perhaps a sibling or two) and broke his wrist. It was in a cast from his neck to his wrist, for months, it seemed. When I told my mom I was moving the piano, and it looked like it was really happening (yesterday, that is) she was so excited and relieved. I feel like it was one of the first times I could really do something nice for her. It consisted of a day and a half of bureaucratic paper shuffling, phone calls, arranging insurance, insurance riders, coordinating people who are harassed and busy all day. Thank god for email ( no more faxing!) and a flexible workplace where I could make phone calls. I found out that one mover, for 50% less, could do it if it was tomorrow. I had to make room, make sure folks were there at the pickup site on time, available at my apartment, coordinate the move, etc. And, I had to finally dejunk the little alcove that has collected computers parts and paperwork for 5 years. Correction, cough, 9 years. The hardest part of having it is being OK with being loud. In city living, we make more compromises, and I love how quiet my building is. I broke into the new piano by playing my favorite piano piece, “Confidence” from “Songs Without Words,” by Mendelssohn. Then, “Remembrance” another small piano piece by Schumann. I stumbled a few times, noticed some new out of tune keys, realized how grungy the keys were. It was 5pm, I hoped I wasn’t interrupting my neighbor’s kids’ naps. Let’s hope. Written Thursday, June 27th, 2013 in nostalgia. You can leave a response, or trackback from your own site.